Ilya Bolotowsky was born in Petrograd (now Saint Petersburg) Russia in 1907. His family emigrated to Turkey in 1920 where they lived until 1923 when they left to settle in New York. He studied at the National Academy of Design, worked as a textile designer, and produced murals and paintings for the Public Works of Art Project and Works Progress Administration during the 1930s. He was a founder of the American Abstract Artists when they formed in 1936 as a discussion and exhibition group. 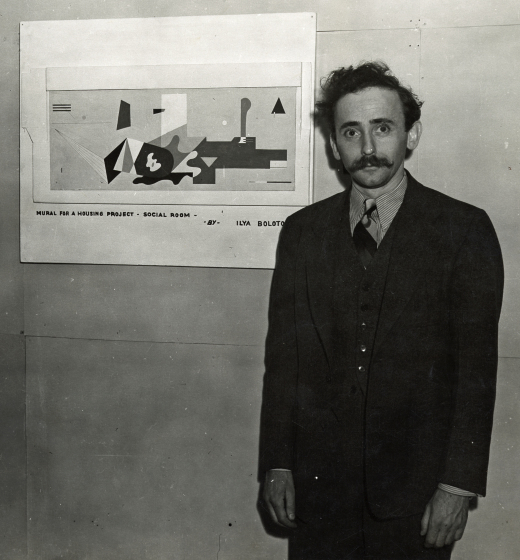 A decade later, from 1946 to 1948, he lead the art department at Black Mountain College (Black Mountain, NC) and continued to experiment with geometric abstraction derived from Piet Mondrian's Neo-plasticism. Bolotowsky explored variations of this style for nearly fifty years until his death in 1981. DMA Acquisition proposal (2006.6), 2006. Nancy J. Troy and Rina Arya. "Bolotowsky, Ilya." Grove Art Online. Oxford Art Online. Oxford University Press, accessed November 25, 2014, http://www.oxfordartonline.com/subscriber/article/grove/art/T009753.